WaterNSW has closed public access to Berembed weir recreational area due to concerns about illegal and anti-social behaviour taking place. Reports of unauthorised firearm use and animal remains being found at the picnic area have prompted the closure of the area, located on the Murrumbidgee River between Wagga and Narrandera. The area will remain closed to the public while WaterNSW determines a course of action to address the problem, according to WaterNSW executive manager of system operation and asset management, Adrian Langdon. “We have been receiving disturbing information from the community about ongoing anti-social behaviour at the area adjacent to the weir, including reports of firearms discharging and dead animals being left in the area,” he said. “As custodians of the area WaterNSW has a responsibility to discourage this potentially illegal activity, and address the risk this might pose to the public. 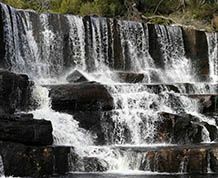 For more information on WaterNSW go to www.waternsw.com.au.